UFC 132 Countdown - Full Episode - Can Dominick Cruz turn the tables at UFC 132 and avenge the only loss of his career against Urijah Faber? Plus, watch modern day legends Wanderlei Silva and Tito Ortiz prepare for Chris Leben and Ryan Bader in the countdown to UFC 132. Aired on Spike TV at 1:12 PM EST on Wednesday, June 29th, 2011. UFC Bantamweight Champion Dominick Cruz defends his title against former WEC Featherweight champ Urijah Faber at UFC 132. June 27th, 2011 - SportsNet's Showdown Joe recaps a crazy night of fights at UFC Live on Versus 4 from Pittsburgh, USA. Joe also previews UFC 132: Cruz vs. Faber and takes an in depth look at how Dominick Cruz and Urijah Faber can end a fight. MMA fight video of "Michael Johnson vs. Edward Faaloloto" in a free Facebook-Streamed Lightweight Prelim Bout @ UFC Live on Versus 4: Kongo vs Barry in Pittsburgh, Pennsylvania, USA on Sunday, June 26th, 2011. James Toney and Ken Shamrock Nearly Fight at a MMA Pre-fight Press Conference. The Post-Fight Press Conference that took place right after UFC Live on Versus 4: Kongo vs Barry from the Consol Energy Center in Pittsburgh, Pennsylvania, USA on Sunday, June 26th, 2011. MMA fight video of Joe 'Daddy' Stevenson (FW Featherweight Debut) vs. Javier Vazquez in a free Facebook-Streamed Featherweight Prelim Bout @ UFC Live on Versus 4: Kongo vs Barry in Pittsburgh, Pennsylvania, USA on Sun. June 26th, 2011. Joe Stevenson vs Javier Vazquez Fight Starts @ 70:30 in above video. MMA fight video of "Manny 'Manvel' Gamburyan vs. Tyson Griffin" in a free Facebook-Streamed Featherweight Prelim Bout @ UFC Live on Versus 4: Kongo vs Barry in Pittsburgh, Pennsylvania, USA on Sunday, June 26th, 2011. Nate Marquardt Suspended Indefinitely By PSAC / Main Event - UFC on Versus 4: Marquardt vs Story becomes UFC Live on Versus 4: Kongo vs Barry. The Pennsylvania State Athletic Commission will not reveal exactly what knocked Nate Marquardt out of tonight’s UFC on Versus 4 event. PSAC executive director Gregory Sirb did say Marquardt had six weeks to get clearance for that fight. Marquardt, who was dropping from middleweight to welterweight for the first time in his UFC career, failed to receive medical clearance, though no one would say exactly why. But Sirb indicated Marqaurdt knows exactly what was expected of him. “We gave him every opportunity,” Sirb said. “The last report we got was 4 o’clock yesterday. We had given him as much leeway as we could, but obviously, when you’ve got a live event, you’ve got to make a call at that time. “He knew the situation,” Sirb said. “There was no surprise. But when it came time to fulfill said requirements, Marquardt fell short. The onetime UFC middleweight title challenger was scratched from the card and ultimately fired by UFC president Dana White. MMA Fight Video of Daniel Roberts vs Rich Attonito in a welterweight prelim bout at UFC on Versus 4: Kongo vs Barry in Pittsburg, Pennsylvania on Sunday, June 26, 2011. MMA Fight Video of "Rich Attonito vs. Daniel Roberts" in a Welterweight Prelim Bout @ UFC Live on Versus 4: Kongo vs Barry in Pittsburg, Pennsylvania, USA on Sun. June 26th, 2011. MMA Fight Video of Cheick Kongo vs Pat Barry in the main heavyweight B=bout @ UFC Live on Versus 4 in Pittsburgh, Pennsylvania on Sun. June 26, 2011. MMA Fight Video of "Patrick Barry vs. Cheick Kongo" in the Main Event Heavyweight Bout @ UFC Live on Versus 4 in Pittsburgh, Pennsylvania, USA on Sunday, June 26th, 2011 on Versus. UFC on Versus 4: Marquardt vs Story Main Event was replaced by Kongo vs Barry as the Main event on Versus. MMA Fight Video of "Rick Story vs. Charlie Brenneman" in the Co-Main Event Welterweight Bout @ UFC Live on Versus 4: Kongo vs Barry in Pittsburgh, Pennsylvania, USA on Sunday, June 26th, 2011. **Charlie Brenneman replaced Nate Marquardt just 24 hours before this event which was originally named: UFC Live on Versus 4: Marduardt vs Story. Nate 'The Great' Marquardt was supposed to debut to the 170 lb welterweight division but was not medically cleared by the State Athletic Commission and have to pull out and be replaced. UFC President Dana White was very disgusted at Marquardt and has cut him from the UFC. MMA Fight Video of "John Howard vs. Matt Brown" in a Main Card Welterweight Bout @ UFC Live on Versus 4: Kongo vs Barry in Pittsburgh, Pennsylvania, United States (USA) on Sunday, June 26th, 2011. MMA Fight Video of "Matt 'Meathead' Mitrione vs. Christian Morecraft" in a Main Card Heavyweight Bout @ UFC Live on Versus 4: Kongo vs Barry in Pittsburg, Pennsylvania on Sunday, June 26th, 2011. MMA Fight Video of "Joe Lauzon vs. Curt Warburton" in a Lightweight Prelim Bout @ UFC Live on Versus 4: Kongo vs Barry in Pittsburg, Pennsylvania, USA on Sunday, June 26th, 2011. MMA Fight Video of "Charles Oliveira vs. Nik Lentz" in a Lightweight Prelim Bout @ UFC Live on Versus 4: Kongo vs Barry in Pittsburg, Pennsylvania, USA on Sunday, June 26th, 2011. MMA fight video of Ricardo Lamas vs Matt Grice in a featherweight prelim bout at UFC on Versus 4: Kongo vs Barry in Pittsburgh, Pennsylvania on Sunday, June 26, 2011. MMA fight video of "Matt Grice vs. Ricardo Lamas" in a Featherweight Prelim Bout @ UFC Live on Versus 4: Kongo vs Barry in Pittsburgh, Pennsylvania, USA on Sun. June 26th, 2011. MMA Fight Video of "Alexandre Bezerra vs. Sam Jones" in a Local Feature Fight (Prelim) @ Bellator Fighting Championships 46 (XLVI) in Hollywood, Florida, USA on Friday, June 25th, 2011. MMA Fight Video of "Nazareno Malegarie vs. Jacob Devree" in a Main Card Featherweight Quarterfinal Tournament Bout @ Bellator Fighting Championships 46 (XLVI) in Hollywood, Florida, USA on Fri. June 25th, 2011. MMA Fight Video of "Marlon Sandro (BFC Debut) vs. Genair da Silva" in the Co-Main Event Featherweight Quarterfinal Tournament Bout @ Bellator Fighting Championships 46 (XLVI) (BFC 46) in Hollywood, Florida, USA on Friday, June 25th, 2011. MMA Fight Video of "Pat Curran vs. Luis Palomino" in the Main Event Featherweight Tournament Quarterfinal Bout @ Bellator Fighting Championships 46 (XLVI) (BFC 46) at the Seminole Hard Rock Hotel & Casino in Hollywood, Florida, USA on Sat. June 25th, 2011. This 8-man featherweight tournament fight card was part of Bellator's inaugural Summer Series and featured opening round fights in the Summer Series Tournament. The event was distributed live in prime time by MTV2. MMA Fight Video of "Ronnie Mann vs. Adam Schindler" in a Main Card Featherweight Tournament Quarterfinal Bout @ Bellator Fighting Championships 46 (XLVI)(BFC 46) at the Seminole Hard Rock Hotel & Casino in Hollywood, Florida, USA on Sat. June 25th, 2011. This fight card was part of Bellator's inaugural Summer Series and featured opening round fights in the Summer Series Tournament. The event was distributed live in prime time by MTV2. UFC Live on Versus 4: Barry vs Kongo Weigh Ins from the Consol Energy Center in Pittsburgh, Pennsylvania - Aired on Saturday, June 25th, 2011 @ 5 PM EST/4 CST/2 PST. **UPDATE: Nate Marquardt out of UFC Live on Versus 4 Event - he was not medically cleared from the Pennsylvania state athletic commission 24 hours before the start of the event. June 24th, 2011 - "Modern Family and Married with Children" tv shows star/actor Ed O'Neill (Al Bundy), a BJJ Brazilian Jiu-Jitsu black belt, joins his BJJ trainer Rorian Gracie and Javier Vazquez on the panel to help Kenny Rice and Bas Rutten preview UFC Live 4: Marquardt vs Story and Ron Kruck reports from the Strikeforce Heavyweight Grand Prix Tournament in Dallas, Texas, USA. The VOICE vs. series returns with its most intense and powerful show to date. The Voice of HDNet, Michael “The Voice” Schiavello goes one on one with K-1 kickboxing legend Badr Hari, in this hour long television event. The Voice vs Badr Hari is the seventh episode in HDNET’s critically acclaimed THE VOICE VERSUS series. Filmed in Amsterdam at Mike’s Gym, with hostings shot around Amsterdam’s scenic canals and Red Light (de Wallen) District, The Voice vs Badr Hari is the most intense and intriguing interview of the series yet. June 24th, 2011 - ESPN's MMA Live recaps the last 2 quarterfinals of the Strikeforce Heavyweight Grand Prix tournament and looks forward to the semifinal matchups. MMA Live previews the UFC's first trip to Pittsburgh this Sunday night, highlighted by Nate Marquardt's 170 lb welterweight division debut against Rick Story. An extended preview of the UFC Live card in Pittsburgh, as Tyson Griffin makes his UFC 145 lb featherweight division debut. MMA Live examines the issues facing mixed martial arts legislation in New York State. UFC light heavyweight Stephan Bonnar also checks in with an update. MMA Fight Video of "Caros Fodor vs. James Terry" in the Main Event Lightweight Bout @ Strikeforce Challengers 16: Fodor vs Terry in Kent, Washington, USA on Friday, June 24th, 2011. MMA Fight Video of "Ryan Couture vs. Matt Ricehouse" in the Co-Main Event Lightweight Bout @ Strikeforce Challengers 16: Fodor vs Terry in Kent, Washington, USA on Friday, June 24th, 2011. MMA Fight Video of "Gian Villante vs. Lorenz Larkin" in a Main Card Light-Heavyweight Bout @ Strikeforce Challengers 16: Fodor vs Terry in Kent, Washington, USA on Fri. June 24th, 2011. MMA Fight Video of "Jason High vs. Quinn Mulhern" in a Main Card Welterweight Bout @ Strikeforce Challengers 16: Fodor vs Terry in Kent, Washington, USA on Friday, June 24th, 2011. June 20th, 2011 - Showdown Joe recaps the Strikeforce Heavyweight grand prix tournament quarterfinals in Dallas, Texas, USA. Showdown Joe takes an in depth look at UFC Live Marquardt vs. Story (UFC Live on Versus 4). 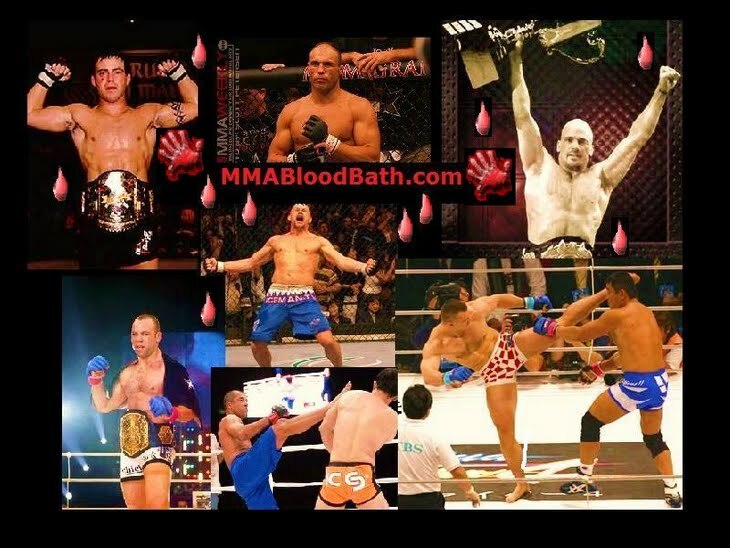 Showdown Joe also takes a look at mixed martial artists trying to find the perfect weight. The Post-Fight Press Conference that took place right after Strikeforce 34: Overeem vs Werdum from the American Airlines Center in Dallas, Texas on June 19th, 2011. MMA Fight Video of "Jorge Masvidal vs. KJ Noons" in a Main Card Lightweight Bout @ Strikeforce: Overeem vs Werdum in Dallas, Texas, USA on Sat. June 18th, 2011. MMA Fight Video of "Daniel Cormier vs. Jeff Monson" in a Main Card Heavyweight Bout @ Strikeforce: Overeem vs Werdum in Dallas, Texas, United States on Sat. June 18th, 2011 on Showtime. MMA Fight Video of HW Champ "Alistair Overeem vs. Fabricio Werdum II" in the Main Event Heavyweight Grand Prix Quarterfinal (Non-Title) Bout @ Strikeforce: Overeem vs Werdum in Dallas, Texas, USA on Sat. June 18, 2011 on Showtime. Winner moves on to the Semifinals to face Antonio 'Bigfoot' Silva. MMA Fight Video of "Brett 'The Grimm' Rogers vs. Josh 'The Baby Faced Assasin' Barnett" in the Co-Main Event Heavyweight Grand Prix Quarterfinal Bout @ Strikeforce: Overeem vs Werdum in Dallas, Texas, USA on Saturday, June 18th, 2011 on Showtime. Winner of this bout moves onto the Semifinals to face Sergei Kharitonov. MMA Fight Video of "Chad Griggs vs. Valentijn Overeem" in a Main Card Heavyweight Bout @ Strikeforce: Overeem vs Werdum in Dallas, Texas, USA on Sat. June 18th, 2011. MMA Fight Video of "Gesias JZ Cavalcante vs. Justin Wilcox" in a Lightweight Prelim Bout @ Strikeforce: Overeem vs Werdum in Dallas, Texas, USA on Sat. June 18th, 2011. MMA Fight Video of "Brian Melancon vs. Isaac Vallie-Flagg" in a Catchweight (175 lb) Prelim Bout @ Strikeforce: Overeem vs Werdum in Dallas, Texas, USA on Sat. June 18th, 2011. MMA Fight Video of "Conor Heun vs. Magno Almeida" in a Lightweight Prelim Bout @ Strikeforce: Overeem vs Werdum in Dallas, Texas, USA on Sat, June 18th, 2011. MMA Fight Video of "Joe Ray vs. Nah-Shon Burrell" in a Catchweight (180 lb) Prelim Bout @ Strikeforce: Overeem vs Werdum in Dallas, Texas, USA on Sat. June 18th, 2011 on Showtime. June 17th, 2011 - On the eve of their big fight, Alistair Overeem and Fabricio Werdum step on the scales on a special "Inside MMA" live from the Strikeforce Grand Prix Heavyweight Tournament weigh ins. Kenny Rice, Bas Rutten and Ron Kruck break down the entire card from Dallas, Texas (TX), USA. June 17th, 2011 - The heavyweights take center cage, as ESPN's MMA Live looks back at JDS Junior dos Santos' win at UFC 131 against Shane Carwin and ahead to the Strikeforce Heavyweight Grand Prix Tournament. MMA Live continues its Strikeforce preview and talks to Kenny Florian about his successful featherweight debut and the accompanying weight cut. Extended pictures from UFC 131 and updates on British fighters Michael Bisping and Paul Daley from the international man of mystery. MMA Live examines the UFC's middleweight division following Mark Munoz's decision victory over Demian Maia at UFC 131. June 13th, 2011 - SportsNet's Showdown Joe recaps UFC 131: Dos Santos vs Carwin from Rogers Arena in Vancouver, Canada. Showdown Joe goes Inside the Octagon to get you caught up with the top stories in MMA. Showdown Joe takes a look at the return of Alistair Overeem against Werdum this Saturday in Strikeforce. Strikeforce: Overeem vs Werdum Weigh Ins from the American Airlines Center in Dallas, Texas, USA - Aired on Friday, June 17th, 2011 @ 5 PM EST/4 PM CST/2 PM PST. The UFC is just two months away from hosting the biggest MMA event Brazil has ever seen, and as it continues to promote the UFC 134 fight card, the organization hosted a press conference in Rio de Janeiro on Thursday, June 16th, 2011 @ 2 PM EST/1 CST/11 AM PST. The UFC Rio press conference will include UFC President Dana White, UFC middleweight champion Anderson Silva (who defends his belt against Yushin Okami in the main event), Mauricio "Shogun" Rua (who fights Forrest Griffin), and Antonio Rodrigo "Minotauro" Nogueira (who fights Brendan Schaub). The Post-Fight Press Conference that took place right after UFC 131: Carwin vs Dos Santos from the Rogers Arena in Vancouver, British Columbia, Canada on Sat. June 11th, 2011. MMA Fight Video of "Michihiro Omigawa vs. Darren Elkins" in a free live Youtube/Facebook Streamed Featherweight Prelim Bout @ UFC 131: Carwin vs Dos Santos in Vancouver, British Columbia (BC), Canada on Sat. June 11th, 2011. MMA Fight Video of "Krzysztof Soszynski vs. Mike Massenzio" in a free live Youtube/Facebook Streamed Light-Heavyweight Prelim Bout @ UFC 131: Carwin vs Dos Santos in Vancouver, British Columbia (BC), Canada on Sat. June 11th, 2011. MMA Fight Video of Junior "Cigano" Dos Santos (JDS) vs. Shane Carwin in the Main Event Heavyweight Bout @ UFC 131 in Vancouver, British Columbia, Canada on Saturday, June 11th, 2011. Winner gets a Title Shot against UFC HW heavyweight Champion Cain Velasquez. MMA Fight Video of "Kenny 'KenFlo' Florian vs. Diego Nunes" in a Co-Main Event Main Card Featherweight Bout @ UFC 131: Carwin vs Dos Santos in Vancouver, (BC) British Columbia, Canada on Sat. June 11th, 2011. MMA Fight Video of "Demian Maia vs. Mark Munoz" in a Main Card Middleweight Bout @ UFC 131: Carwin vs Dos Santos in Vancouver, British Columbia (BC), Canada on Sat. June 11, 2011. MMA Fight Video of "Donald 'Cowboy' Cerrone vs. Vagner Rocha" in a Main Card Lightweight Bout @ UFC 131: Carwin vs Dos Santos in Vancouver, British Columbia, Canada on Sat. June 11th, 2011. MMA Fight Video of "Jon Olav Einemo vs. Dave Herman" in a Main Card Heavyweight Bout @ UFC 131: Carwin vs Dos Santos in Vancouver, British Columbia, Canada on Saturday, June 11, 2011. MMA Fight Video of "Nick Ring vs. James Head" in a free live Youtube/Facebook Streamed Middleweight Prelim Bout @ UFC 131: Carwin vs Dos Santos in Vancouver, British Columbia (BC), Canada on Saturday, June 11th, 2011. MMA Fight Video of "Jesse Bongfeldt vs. Chris Weidman" in a free Spike TV Middleweight Prelim Bout @ UFC 131: Carwin vs Dos Santos in Vancouver, British Columbia, Canada on Sat. June 11th, 2011. MMA Fight Video of "Yves Edwards vs. Sam Stout" in a free Spike TV Lightweight Prelim Bout @ UFC 131: Carwin vs Dos Santos in Vancouver, British Columbia (BC), Canada on Sat. June 11th, 2011. MMA Fight Video of "Dustin Poirier vs. Jason Young" in a free Youtube/Facebook Streamed Featherweight Prelim Bout @ UFC 131: Carwin vs Dos Santos in Vancouver, British Columbia, Canada on Saturday, June 11th, 2011.